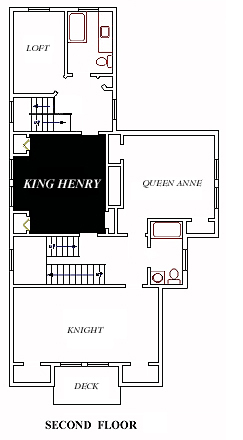 The King Henry is situated commandingly at the center of the Home. It is the only Rental Unit that has easy access to both hallways. This is a second floor bedroom that would commonly be referred to as the Master Bedroom. The floors are a Golden Hardwood and the walls are currently painted a Clean White. There are 3 generous closets, and a hardwood fireplace mantle. It is the warmest room in the Winter, and it is Centrally Air Conditioned in the Summer. A wonderful view through the trees to the neighboring Stone Mansion fills the large 6' x 7' window.